Cigna, Oracle, Mattel and J.M. Smucker kick off a second week of merger Mondays, signaling a recovery in dealmaking. NEW YORK ( TheStreet) -- A flurry of M&A activity hit Wall Street on Monday, making it the second week running of big announcements that may signal a recovery in dealmaking. 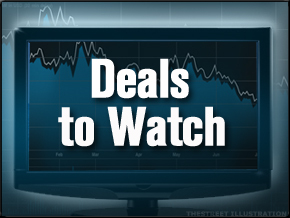 Compared to last week's energy boom, today's deals span different sectors and industries, making the common element a depressed market that's a great opportunity for buyers to pick up companies for cheap prices. Cigna ( CI - Get Report) has agreed to acquire HealthSpring ( HS for $55 a share in cash, or $3.8 billion. The purchase price is a 37% premium to HealthSpring's closing price Friday of $40.16 - it's stock rose over 33% to $53.70 a share in early trading. Cigna's stock rose nearly 1% in early trading to $46.15 a share. The transaction is expected to close during the first half of 2012 and isn't subject to a financing condition, Cigna said Monday. "HealthSpring is a great fit with Cigna's growth plans to expand into the Seniors and Medicare segment through a premier business and trusted brand name," said David M. Cordani, President and Chief Executive Officer. In its statement of the merger, Cigna said the HealthSpring acquisition will add to near and long term growth. In 2010, HealthSpring earned $3.1 billion in revenue and had net income of nearly $200 million - its most profitable year since going public in 2006. In its most recent quarter ended in June, HealthSpring earned $83.9 million, its best quarter ever. HealthSpring will be merged to larger Cigna with $5.5 billion in 2010 revenue and $400 million in profits. The company also has cash and short term investments of $1.77 billion according to financial statements as of June 30th. The Franklin, Tennessee based- healthcare provider founded in 2000 was ranked the 71st fastest growing company in Fortune Magazine's most recent poll of three-year revenue, earnings per share and total return. It's also the largest provider of Medicare Advantage selling to over one million customers. It has also received approval from the government to add an additional 243 thousand subscribers in Alabama, Tennessee and West Virginia. According to Bloomberg data, the company's grown at 21% in the past two years. In a statement announcing the merger, Cigna said it intends to raise approximately 20% of the purchase price by selling new stock, with the remaining 80% funded by debt issuance and cash. For the debt component, Cigna said it received bridge financing from Morgan Stanley ( MS - Get Report) contingent on the market liquidity needed to fund the acquisition. Cigna also said it expects to maintain current credit ratings after the deal closes. It's the largest merger among healthcare providers in the last 12 months after Tenet Healthcare ( THC - Get Report) rejected Community Health Systems' ( CYH - Get Report)$3.3 billion merger in May according to data compiled by Bloomberg. The merger is also the 6th largest deal in the healthcare sector in the last 12 months according to Bloomberg data. Johnson & Johnson's ( JNJ - Get Report) $21.3 billion takeover of Synthes is the largest closed deal in that time period. In the pharmacy's space, Medco Health Solutions's ( JNJ - Get Report) $29 billion merger with Express Scripts ( ESRX has faced increasing regulatory scrutiny. Oracle ( ORCL - Get Report) has agreed to buy RightNow Technologies ( RNOW for $43 a share, valuing the cloud technology company with a customer service specialty at $1.5 billion when counting its debt. RightNow's board has unanimously approved the deal, which needs shareholder and regulatory approvals. It expects the merger to close at the end of the year or early 2012. The announcement didn't state whether the transaction is cash or stock. At $43 a share, the purchase represents the highest price paid for RightNow, which went public in 2006. The Bozeman, Montana based company founded in 1997 closed Friday trading at $35.96 a share and has gained 51.9% year to date. It gained over 19%, reaching $42.83 a share in early trading. The deal is a boost to its Oracle Public Cloud business, and bolsters its presence in call center and social networking spaces. It's also Oracle's largest acquisition since its $7.4 billion purchase of Sun Microsystems that closed in 2010. As of its most recent quarter, Oracle's sitting on over $31.6 billion in cash and short term investments. Oracle Public Cloud, announced in Oracle Openworld in October a push to bolster its presence in the space by integrating cloud businesses to its Oracle Fusion applications, middleware and databases. "The Oracle Public Cloud is a little different," said Oracle CEO Larry Ellison at Openworld, in San Francisco - stressing that the public cloud can be combined and is interoperable with other existing clouds in business datacenters. "Oracle is moving aggressively to offer customers a full range of Cloud Solutions including sales force automation, human resources, talent management, social networking, databases and Java as part of the Oracle Public Cloud," said Thomas Kurian, an executive vice president at Oracle. RightNow's largest shareholder is founder and CEO Greg Gianforte, who owns over 6.7 million shares -- roughly 20% of all shares with a worth now in excess of $250 million according to filings with the Securities and Exchanges Commission. Its third largest shareholder is venture capital firm Greylock Partners. RightNow reported annual revenue of $185 million and net income of $28.4 million in 2010. In a statement announcing the deal, RightNow founder and CEO Greg Gianforte said , ""RightNow's products add leading customer experience capabilities that help empower companies to interact with and provide a consistent experience to customers across channels." J.M Smucker ( SJM - Get Report) has agreed to buy the North American coffee and hot beverage divisions of Sara Lee ( SLE for $350 million and an additional $50 million over 10 years. J.M. Smucker said in a press release announcing the deal that the purchase of Sara Lee's coffee business, which includes its Douwe Egberts concentrated liquid coffee formula served up in diners nationwide as well as ground coffee, cappuccino and tea products. The company said that buying Sara Lee's foods divisions will add 450 employees and $100 million in sales starting in 2012 and is not expected to hurt earnings excluding a $25 million transaction cost. The Sara Lee coffee and tea brands will be added to Smucker's distribution of Folgers, Dunkin Donuts, Café Bustelo, Carnation and Café Pilon brands. The 110 year old company also sells fruit spreads, peanut butter, ice cream and Pillsbury bakery products. Sara Lee stock was unchanged at $17.77 in early trading. It's a further push in Sara Lee's breakup strategy, which was announced in January. The company said it would split its household products and foods businesses from its coffee businesses into two publicly traded companies. It was a split of Sara Lee's $4.1 billion foods businesses and its $4.6 billion coffee business, according to company filings at the end of 2010. Mattel ( MAT - Get Report) said Monday it would buy HIT Entertainment, which owns preschool brands such as Thomas & Friends, Barney and Bob the Builder, for $680 million in cash. Mattel is buying HIT from a consortium of private equity investors led by Apax Partners funds. Apax bought HIT in 2006 for $890 million, taking the company private. Currently the entertainment channel, originally the distribution arm of Jim Henson Productions -- renamed and sold in 1990 after his death -- has sub investment grade credit ratings. Mattel said it plans to finance the acquisition with a combination of cash and debt. The deal is expected to close in the first quarter of 2012. Mattel said the acquisition isn't expected to have a material impact on its 2012 earnings. Mattel shares gained over 1.6% in early trading to $28.15 a share. In its most recent quarter ended in September, Mattel earned nearly $2 billion in revenue and $300 million in profits, increases of over 5% from the same period in 2010. According to a press release announcing the deal, HIT has revenue of more than $180 million and it's one of the largest independent owners of preschool intellectual property. The company has T.V. shows in 240 countries and 45 languages, according to its company website. Mattel will not be purchasing HIT's interest in the cable network station, Sprout.